If you're not already familiar with the Match Color command, read the solution for "Matching Lighting and Color Between Images." Arrange your Photoshop document so that the two images that you want to combine are on separate layers, as shown below. In this solution, I'm using the lighthouse photo from an earlier solution, and a photo of some clouds. I want to modify the cloud image so that its colors match those of the lighthouse image. First, let's match the colors. 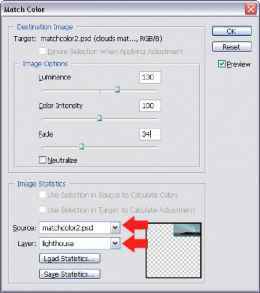 Bring up the Match Color dialog box by clicking on the cloud layer in the Layers palette, and then selecting Image > Adjustments > Match Color. In the dialog box that appears, select your currently open document from the source drop-down, and select the source layer (which is the lighthouse layer, in this case) from the Layer dropdown, as shown at right. With the Preview checkbox ticked, adjust the other settings until the color tones for both images match as closely as possible. 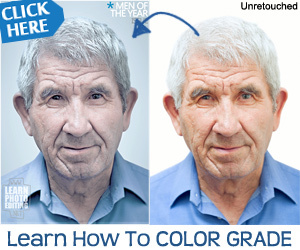 Click OK to apply the changes.